Can Trump Pardon Himself? A Constitutional Conundrum. Scandals continue to build against a Trump Administration caught in a series of lies trying to cover the scandals. The President has engaged in a pattern of attempting intimidate those charged with investigating him. This steady stream of intimidation may form its own basis to prosecute him for obstruction of justice. There are now widespread reports the President has sought advice on whether he can pardon members of his family, or even himself. However, there are always exceptions even to things supposedly without exceptions. For example, the Congressional power to tax has also been described as plenary, but Congress could not (for example) decide to impose a special tax on Jews. Addressing this question is difficult because there is no case law. No President has ever pardoned himself, the closest is probably when Ford pardoned Nixon. Pretty much all we have to go on is the text of the Constitution, so let’s see where that gets us. The President cannot pardon himself for impeachment purposes. The power of Congress to impeach would be rather worthless if the President could just pardon his way out of it, and the Constitution makes clear he cannot. Here is the Pardon Clause in Article II, Section 2. So that question is answered clear as a bell. The President cannot use the pardon power to dodge impeachment. This also shows the pardon power is not absolutely plenary. It is expressly limited. Whether the President can pardon himself from post-impeachment prosecution is a tougher call, but I think not. Amongst the likely purposes of this provision was to prevent an impeached President from claiming he could not be subsequently prosecuted again for the same crimes because of the double jeopardy clause. However, the clear purpose of this provision was to allow for criminal prosecution of an impeached President. The point of that would be rather weak if the President could just pardon himself out of it two minutes before the Senate vote to convict him. Further, this provision should be combined with the pardon clause expressly prohibiting exercise of the pardon power “in cases of impeachment.” Collectively they show a clear Constitutional intent to allow criminal prosecution of an ousted President after impeachment and conviction. The President may be able to pardon himself before resigning. I think that once the House votes to impeach the above analysis applies because there is an existing “case of impeachment.” Thus, once the House votes to impeach the President cannot pardon himself even if the Senate has not yet convicted him. For example, Clinton could not have pardoned himself after the House approved impeachment articles effectively indicting him. But what if Nixon had pardoned himself just before he resigned? At that time the House Judiciary Committee had approved articles of impeachment, recommending them to the House, but the House had not voted on them. 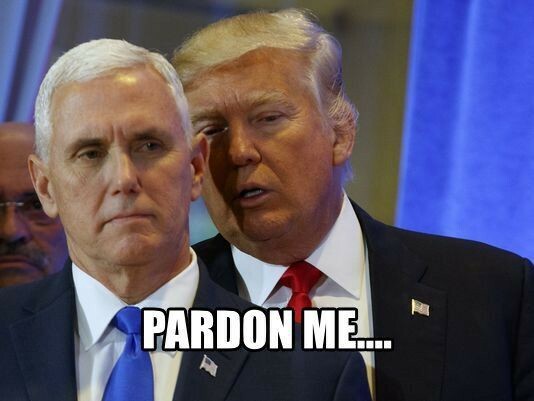 What if President Trump tomorrow issued a pardon for himself and a few minutes later resigned? This is a much tougher question and I simply cannot find any Constitutional text to address it. Frankly, I think the fall back position is to the plenary power of the President to pardon, and that therefore he could do this. There is room for disagreement. Just prior to Nixon’s resignation the Department of Justice Office of General Counsel issued an opinion arguing the President cannot pardon himself because it would violate “the fundamental rule that no one may be a judge in his own case.” However, while that may be a “fundamental rule” for the judiciary, it is not one I see in the Constitution restricting the Chief Executive’s pardon power. A pardon does not judge guilt or innocence. It simply relieves all punishment whether a person is guilty or not. However, it should be noted the Supreme Court has ruled the acceptance of a pardon is an admission of guilt. Thus to accept his own pardon the President would have to acknowledge his guilt.